Monday mornings beg for something special and delicious, don’t they? Like maybe a cookie? Just as a rule, we don’t eat cookies for breakfast. I know, I know, some mornings that sounds pretty appealing, but we try to keep breakfast focused on protein and away from sugar as much as possible. These muffins are based on the flavor profile of a Linzer cookie–you know, those pretty almond cookies with raspberry jam in the center? 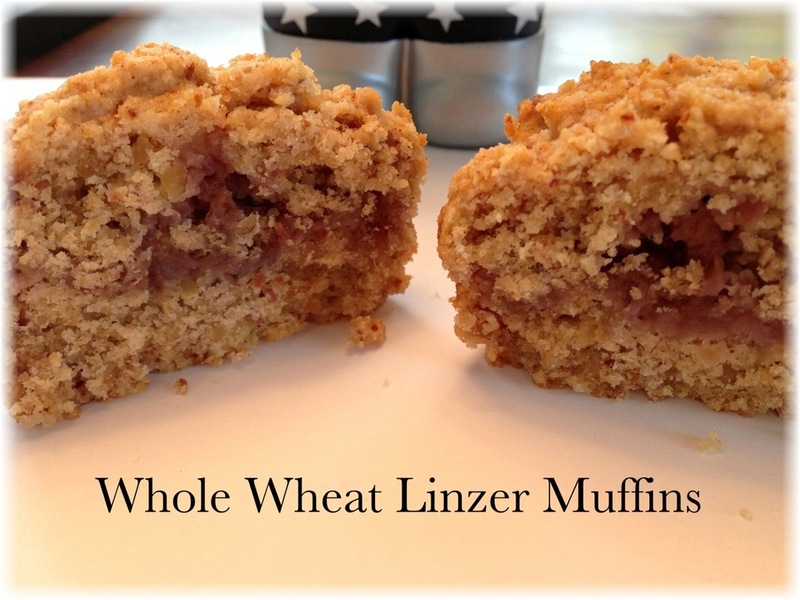 I found a recipe on Epicurious for these Linzer muffins and, after some adaptations, we found them to be a delicious and fairly healthy way to start the day or have a snack. The original recipe uses an obscene amount of sugar, which we cut way back (and never noticed). We also substituted whole wheat flour for the regular flour and homemade, low sugar raspberry jam from last summer for the filling. And we did not top them with confectioner’s sugar, although I know that is a hallmark of Linzer cookies. The end result was a nutty, crunchy, satisfying muffin with a sweet jam interior. I could have used more jam in the center–I was worried about it leaking out the sides. Next time, I’ll add a little more jam, but the amount we used was still more than enough to give us that sweet raspberry flavor. Definitely, even with the reduced sugar, these muffins were sweet enough to make everyone happy! Improve your Monday morning (or afternoon tea) with a muffin that is just sweet enough, but still packs some good antioxidants and protein! Each muffin has approximately 240 calories and 4.8 grams of protein. Preheat oven to 400 degrees and grease cups of a 12 cup muffin tin. In a food processor, add almonds and sugar and process until almonds are finely ground (about 20 seconds). In a large bowl, mix almond mixture, flour, baking powder, salt and cinnamon. In a smaller bowl, whisk together milk, butter, egg and extract. Add wet ingredients to dry and stir just to combine (don’t overmix!). This batter will be rather thick. Add about 2 tablespoons of batter to each cup and flatten a bit, if necessary, so batter covers entire bottom of cup. Add 1 teaspoon or so of jam to the top of the batter in each cup. Top with the remaining batter, making sure the jam is covered. Bake for 18-20 minutes. Tops will just barely be golden. Let cool in pan for 10 minutes, then turn muffins out onto a cooling rack. I dare you not to eat one while they are still hot. I.Dare.You. Serve while warm. These will store in the refrigerator for up to 5 days. Cute! And 240 calories? That’s a pretty good deal. They are tasty and smell so good! I think it’s the almonds. Def more jelly next time though!